I was on Twitter and, after several years, finally clicked on an ad. The ad was for a free download/ebook from Yahoo titled "Writing Ad Copy That Converts." The author is Frank Palmieri, who, according to LinkedIn, is Manager, Creative Strategy at Yahoo. He works in Burbank. I'm sure you can find the download but if you can't, see if this link works. 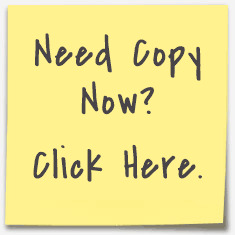 As a direct response copywriter, I'm constantly downloading "free" guides to copy and direct marketing. Here are my thoughts about the Yahoo lead magnet. It's clearly written for novice advertisers who are new to Yahoo. Nothing wrong with that. The content sort of veers toward the "branding" side then happily moves back to the direct response side. I love the emphasis on testing. Testing will show that direct response copywriting techniques will always win. The ebook states, "The best copywriters are also the best storytellers." Sometimes that's true ... sometimes it's not. A good story can help to improve conversion but not always. It depends on the product and the audience. The ebook is ultimately about direct response copy but uses different language to describe it. I like the emphasis on direct marketing tactics. We're told to "Eliminate unnecessary words ... words like “that,” “furthermore,” and “in addition” don’t add anything to your writing. Those words are VITAL to a direct response copywriter. The message is ultimately more important than semantics. The reader is asking "what's in it for me?" and isn't too worried about exact phrasing. The ebook is just 15 pages and you're not going to learn much about copywriting in 15 pages ... BUT ... it's a start. It's excellent to get the reader excited and curious about copy. If I had written the piece then I would have provided suggestions for further reading. But I'm glad Yahoo is providing this piece because it helps business owners understand the importance of copy ... and some copywriting fundamentals. Put 100 direct response copywriters in a room and they would have written 100 different versions of this ebook. This proves, perhaps, my point about testing and why I'm so excited it's part of the ebook. There's no right or wrong in copy: just testing.